The blooms are blooming faster than I can pick them. It must be July! We're well into the season now- so well into it that I completely forgot to do a June newsletter (oops)! It's been such a busy season but I can't complain- we have great customers, new wholesale clients for the salt, and more stem bars coming up! This time of year us growers start to get weary- sore muscles and fatigue start to set in and as much as we love being surrounded by flowers all of the time- we need a break! So, at the end of the month HBG goes on vacation from July 28-August 4th. I'll be back refreshed and ready to tackle the last half of the season. But, before we get there, there are lots of opportunities to see us out and about whether you're looking for flowers or herb salt! Check out what we have going on below. Hummingbird Gardens featured on Virginia This Morning!! We had our first drone footage taken of the garden when Jessica came to interview me for the Made in RVA segment for Virginia This Morning. I had such a nice time showing her around and talking about how the garden came to be and why it continues. If you haven't had a chance to visit or want to learn more about HBG, please watch! We have two stem bars coming up this month! Our first is where we had out very first one- Perk! Bon Air! See you there on July 15th from 10-1! We'll also be at Blue Bee Cider on July 20th from 5:30-8:30. AND- they're doing puppy portraits at the same time! We're hoping to make a few puppy sized flower crowns for the event. Facebook event page is forthcoming! Come get your salt fix on Saturday, July 28th and meet our workshare, Chloe! 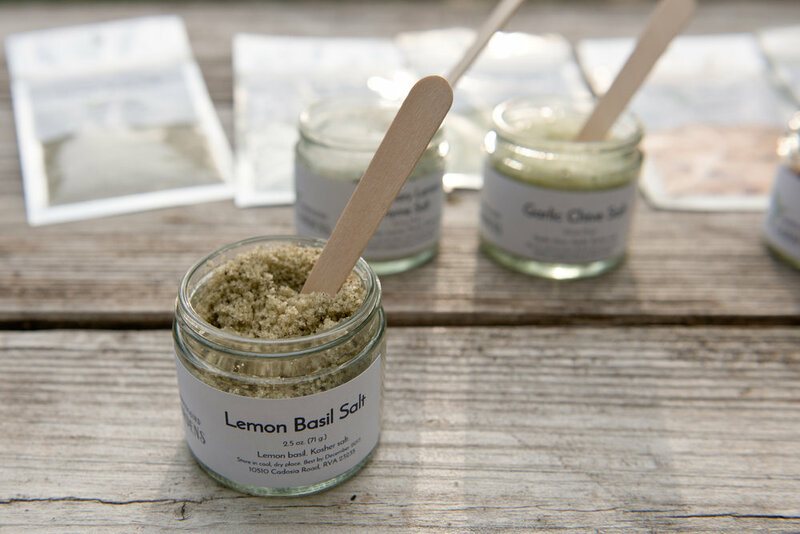 All of the salts will be available along with advice for how to use them, recipe cards, and samples galore! It'll be our first time at St.Stephen's and we'd love to see you! LEMON AND THAI BASIL SALTS ARE HERE! They're baaaaack and we've got them up at the online shop! Have a taste of summer with anything and everything you cook. Bonus: HBG is donating 25% of July's online sales to Central Virginia Sanctuary Network. "The goal of the network is to create spaces in our congregations and localities where all people are safe and free. Central Virginia Sanctuary Network members meet with local law enforcement, advocate at the General Assembly, and participate in public demonstrations — all in solidarity with our neighbors who are at risk of deportation."